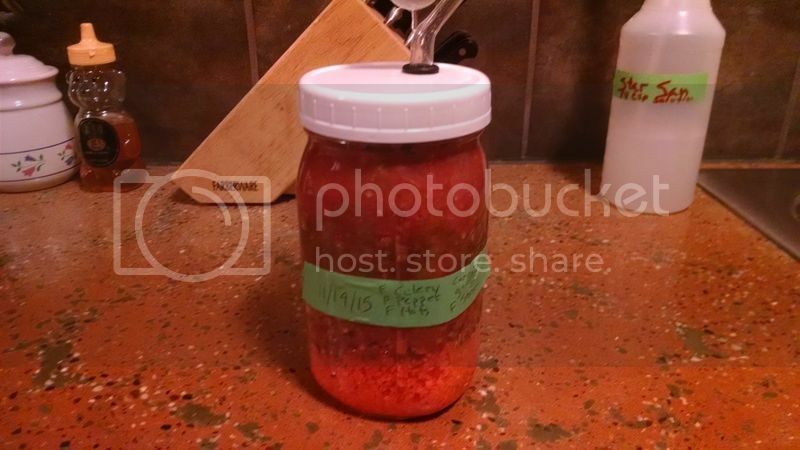 Tomatoville® Gardening Forums Index > Harvest Time > Preserving Your Harvest > Fermenting. Yeah I know there are a few places here about pickles and so on. But I couldn't find a spot just for fermenting. Plus I wanted to show off my new 15 liter German style fermenting crock I bought on line. I cant wait to get this thing in so I can make some real sauerkraut not that canned garbage in the store. How I ended up with it is I had to order some more curing powder and then I remembered I needed casings but something was nagging at me. So last night I just left the page open and this morning I remembered, fermenting crock. So here it is I cant wait to get it in. I will also post my failures here when I start the mess and any of you guys can to as well with questions or projects. That's a really nice one! Where did you order from? How do they work, Worth? I am interested in making saurkraut. It is supposed to be really bealthy! Something a lot of people don't know about Oregon (and I didn't know until I moved here 2 yrs ago) is that it is heavily populated with Scandinavians. That means sauerkraut and lots of it is made here. I've watched the demos three times now but haven't made it myself yet. Here are some links to information from Oregon State University Master Food Preservers. I got it from The Sausage Maker. They aren't the cheapest people on earth but by darn they stand behind their product. I have ordered from them since before the internet. Ill let you chew on Barbs links and get back with you. I make kraut a quart at a time. I drilled a hole in a lid slightly smaller than aquarium tubing. Cut the tubing at an angle & pulled it through the hole. Cut flat inside the lid a quarter inch from the lid. The other end of the tube goes in a jug of water. I got this idea from a girl in my class who described her fathers methods for wine making. I made a masher from an old hoe handle. I put a double hand full of shredded cabbage in the jar, add a half teaspoon of salt & a half teaspoon of caraway seeds. Mash, repeat till jar is full. use the large leaves from the outside of the cabbage on top to hold the shredded stuff down. Add brine to cover but mostly don't have too if there is enough moisture in the cabbage. I also grind part of the core & add to the jar. I've also added garlic cloves, & onions. That was the best kraut. This is how to make kraut if you can't afford one of those nice crocks with the moat for water around the lid as an air lock. I let mine ferment for about 3 wks. & then refrigerate & eat at will. Usually make a quart or 2 a month, depending on my mood. Okay Pete I looked at the links and they are fine. There are other methods like the one mcool61 describes above. I was raised on homemade sauerkraut made from our own home grown cabbage and salt we mined from the earth. Well I am joking about the salt mine but we did grow our own cabbage. We had a huge crock but not a fancy one like I bought just a simple crock. There would be a layer of cabbage then salt and cabbage and salt and so on till it reached the top. I weight was placed on top and a towel was put over the top of the crock. Soon enough water would start to form the weight would sink lower. After it was finished we would can it in jars. It is very simple you just have to be sanitary but not over board sanitary. The crock I bought has a water ring around it to keep air and critters out but let gas bubble out. I opted not to buy a wood stomper because I am a wood worker and should be able to make my own. The reason I am doing this is not because I have jumped on the latest health food hippie fad. It is because it is part of my heritage and the reason for the German style fermenting crock. The other reason is the source for good imported German sauerkraut has dried up. The store used to carry it but since the economic crash we had a while back all of the stores stopped stocking things that didn't move fast. I cant blame them but I dont have to live with it. I have also read that if you process it you lose much of the health benefits. I dont know if this is true or not. What I do know is I see some wonderful old school Kraut coming my way. I believe that is correct. Processing destroys the beneficial bacteria so you aren't getting the probiotics for your gut if you process it. Much like live culture yogurt is better for you than the pasteurized kind that comes prepackaged. My parents and grandparents had something similar to that crock but it never saw sauerkraut. I remember the two weights. It's what they used for brining cases of fresh green olives they would buy down in Boston's North End. We had a round rock that we would take turns using to whack the olives in order to split them open, then they would go onto the crock for brining before being rinsed and stored under oil. I don't remember what went into the brine or how long they stayed there, but it seemed like a long time to me. Thanks for posting the picture of the crock--it triggered a lot of childhood memories! And I think mom might still have that rock. Well from my friends mother before she died she told me to use enough salt with water to float a new fresh egg. The older the egg the easier it will float. Rotten eggs float in fresh water. Depending on the temperature it can take a couple of months or more. As for olive oil I had rather buy good oil that is bitter and let it age as to buy oil that is older and lost is flavor. To me it is just right when it is light green and tastes sort of like green apples. I love the black bitter oil cured olives with a good beer. They grow olives just south of me I need to check in and see if I cant buy some fresh olives from them to cure in the crock. This thing isn't going to just sit around to collect dust and look pretty. I have one around here some place it is a huge and I mean huge brandy snifter. You fill it with fruit like plums or what ever and then fill it up with brandy. Everyone had one when I was growing up and it was the devil keeping the kids from eating too many brandied fruits. That is a nice crock! I have wanted one(10 lol) for a while. I dove into fermenting heavy this year. I made quart jars and buckets with airlocks. It started with kraut. Then I mixed in diakon, onion and moved into kimchi. Next was hot/dill/sweet pickles, serranos and pepperocinis. Nothing better than a brat/dog with your own toppings. Then pepper season came and I made fermented hot sauces. These turned out much more complex than my normal vinegar sauces. Now I am making beer. It intrigued me how they preserved the harvest in the old days so I tried to somewhat re-create the process. I tried to grow most ingredients except for beer grains. You might say I have a fermenting problem. Rairdog you are the person that made that fine hand rolled summer sausage and showed a pictuer of it in the sausage ans Salami thread it looked nice. Now let me ask, do you make your own bratwurst? I have made a few different venison brats from kits that I was not thrilled about....more pork fat and ditch the kits! Same with German sausage. It was too sweet..skip the kits. Italian, breakfast and salami were all from scratch and most of my home grown ingredients. I need to find a good brat recipe. We had a family dispute concerning deer hunting this year so it's gonna be all pork. Back to fermenting. This hot sauce is carrots, onion, celery, garlic, strawberries, red bell and various super hots from the garden. A little ginger and salt from the store. I will heat, blend and bottle mid Jan.